Spring is in the air, and I find myself making salads and light vegetable dishes instead of heavy hot soups and stews or meat-laden dinners. One can never eat enough vegetables, I find. I eat mountains of it. And I try and make everyone else in the family eat mountains of it too. Which has the disadvantage that the fridge is always empty after preparing one or two meals for a family of four. At the moment we have visitors from overseas. Six hungry mouths to feed. If I don't stock up on a daily basis, the fridge is basically empty by evening. Don't get me wrong, I love my steaks, my seafood, my eggs, my protein of sorts. But I cannot deny that a tasty vegan dish with layers of flavors, textures and colors does it for me too. As you know, I exercise a lot and I can feel the extra nutritional needs on the days or the day after of strenuous training sessions. As long as it is clean and real food, give in to your cravings. Your body just gets what it needs. Like with this dish of green beans. The beans are steamed, just enough to keep the crunch, then topped with sweet chopped dates, crunchy walnuts for some more texture and to add some filling good fats and a pinch of cayenne pepper to give it a bit of steam. Don't you forget the cayenne pepper! 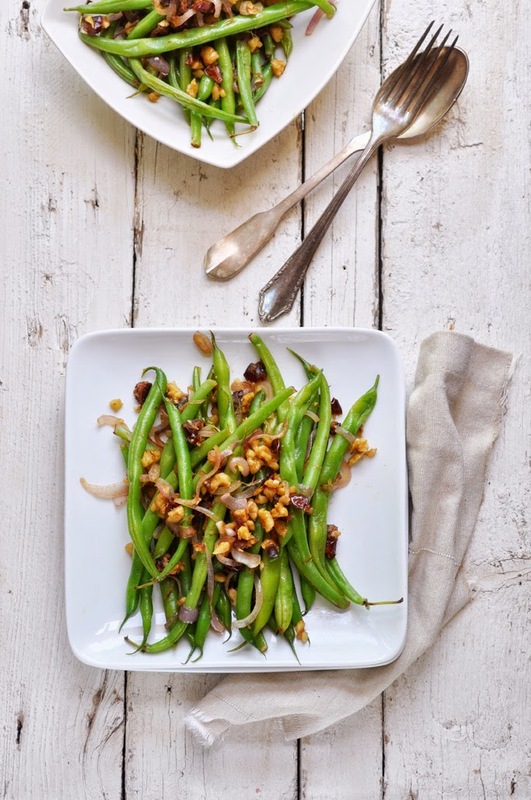 This green bean salad has everything you need and it is filling. If you eat the whole batch, like I did several times before I managed to take a picture. In fact, any dish can be a main dish if you just add enough nuts. It's not just the crunch, it's the good fats that fill you up for a long time and that will not end up on your hips like a carb-laden meal will. I hope you enjoy! Steam trimmed green beans until tender, about 3-4 minutes. Transfer to bowl with ice water to stop cooking process and maintain bright green color of the beans. Meanwhile, in a large skillet, heat olive oil over medium heat. Add sliced onions and cook until softened, about 2 minutes. Add walnuts, dates and cayenne and cook until the nuts are slightly toasted, about 1 more minute. Drain the beans, then add to the skillet. Add salt and cook for a few minutes or until heated through. Season to taste. Serve warm or at room temperature.